Did an official outlet of the Roman Catholic Church actually make such a statement in the late 19th century? Were heresies like humanism and existentialism specifically mentioned as being the result of the Reformation? Or are such statements only found in the writings of Catholic theologians and not the church itself? …by how many roads Modernism leads to the annihilation of all religion. 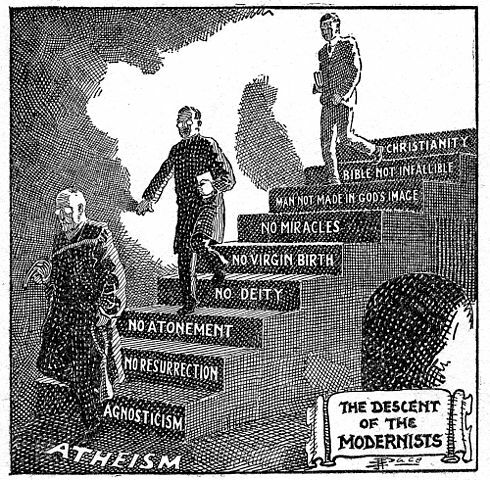 The first step in this direction was taken by Protestantism; the second is made by Modernism; the next will plunge headlong into atheism. Geremia did a good job of bringing to light the words of Pope Pius X, and I'm not sure you're gonna see much more out of the Pope's official capacity since then in the name of ecumenism, plus we're really on the same side against modernism. Ultimately, of course, it is the fruit of the original break-up of Christendom at the Reformation. It began in the denial of a central authority, it has ended by telling man that he is sufficient to himself, and it has set up everywhere great idols to be worshipped as gods. and in Orthodoxy his friend G.K. Chesterton wrote about the delight the moderns take in skinning cats being a direct offshoot of denying fundamental Catholic dogmas like Original Sin. He wrote that while Protestant preachers might deny the sin of skinning a cat while enlightenment thinkers would take it a step further and deny the cat. But both have the same root in the denial of dogmas and the authority to define those dogmas. Not the answer you're looking for? Browse other questions tagged catholicism church-history heresy reformation or ask your own question. How did the Inquisition impact modern Christianity?